Athena is just 7 months old and lives a very interesting life! Her Daddy is a part time race car driver so she travels a lot! She loves to watch him race! Athena has already been on 6 flights so far. She was born into a big family, but was the first grandchild for both sets of her grandparents! She loves music, her aunt Deven even hopes that she will be a musical theater baby like she was! She has two puppies Hanz and Vianna. Hanz is her best friend, especially now that she drops him food from her high chair! Athena’s Mom Chelsea says “We were so very excited when we found out we were pregnant, it was truly a gift from god. Even though we don’t always sleep we couldn’t imagine life with out our goddess!” Athena’s name comes from Greek mythology, Athena was the daughter of Zeus, which just happened to be Athena’s mom Chelsea’s first Yorkshire terrier. And then the name was said to her on a flight back from Florida last Christmas, after finding all this out it went straight to their girl name list! Grace is Athena’s middle name after Chelsea’s grandmother who is no longer with us, but her name is carried on through sweet Athena! Athena was born on November 27th, 2017, her Mom and Dad say “it will forever be a moment we will cherish as a couple and now as a family”. The Saratoga Portrait Studio had such a fun filled afternoon with Athena, her Mom Chelsea and her Dad Keith! 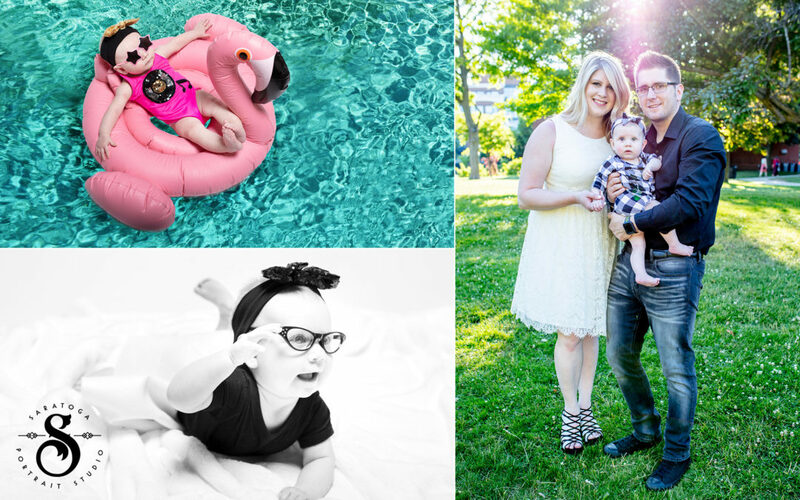 She floated in our portrait studio “pool” with her sunnies, donned a pink tutu and pearls to stand on her Mom’s fabulous pink heels and was even decked out head to toe in racing stripes to snuggle up next to her Dad in his official racing gear! To top it all off – we headed out to Saratoga’s Historic Congress Park at golden hour to capture family photos. We can’t wait to see this stylish, strong little cutie grow up!